Headaches are so common that 85% of the population in a given year will experience one. Usually they come and go, occasionally they can linger for days, weeks and months and may remain constant or may be reoccurring. This can make life miserable for the sufferer. Temporary relief is often sought through pain medications. However, without addressing the cause, the pain can return time and time again and could worsen. Osteopaths treat many patients who suffer from head and neck pain and cranial osteopathy can work extremely well for many types of headaches. The various types of headache produce differing sets of symptoms. Tension headaches affect both sides of the head and are often described as a feeling of tightness or pressure. These types of headache are often associated with stress. Migraines typically affect one side of the head and can be accompanied by nausea and vomiting, abdominal pain, visual disturbances and sensitivity to light or sound. Cervicogenic headaches are daily headaches at the back of the head near the top of the neck, and sometimes with pain around the eyes. These headaches are referred from the upper neck. Cluster headaches cause severe pain on one side near the eye or temple. They are often accompanied by difficulty opening the eye, a sweaty face, or a blocked or runny nose on the same side as the headache. The causes of headaches are wide and varied, so treatment must be individualised. One common type of headache is caused by restrictions in the joints of the neck and back. Nerves that exit the spinal column can become irritated referring pain to the base of the skull, top of the head, and behind the eyes. This may occur as a result of neck injury such as whiplash, postural problems, stress and compensatory change. 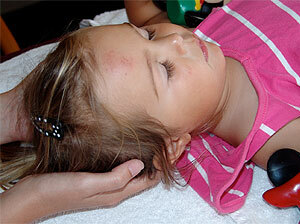 All of these issues can be treated effectively with osteopathy, thereby getting rid of the headache for good. Osteopathy works by correcting alignment and restoring mobility in the spine and joints, decreasing muscular tension, increasing blood flow and reducing nerve irritation. You may also receive advice about posture, stress relief, supplements/diet, exercises and stretches to assist the treatment. "After an accident earlier this year and suffering from severe neck pain and daily headaches, Health Within Osteopathy was recommended to me as a gentler alternative to physiotherapy. My first visit was a step in to the unknown as I had never had therapy of any kind before. As Ingeborg worked her magic and discovered a displaced rib, and found the cause of the neck pain and constant headaches, she then went about treating me with her gentle healing hands and also offered great advice. It took only 3 sessions for me to notice a difference, especially in my neck. There is no bone crunching or anything like that, just very gentle manipulation and support I was taught how to do breathing exercises, how to sit at the PC and more importantly, how long to sit at the PC before doing some stretches. The most important part of all is, the neck pain and headaches have gone and I have no more pain. The consult rooms are at the rear of the building and is very peaceful and so quiet all you can hear is the birds singing. After the session I feel so relaxed and pain free. I have an overall feeling of wellbeing and over a period of time my mood has gone from really low to my usual happy confident self. I don’t know where I would have been without Health Within Osteopathy. The staff are helpful and friendly, the low cost is worth every cent - ACC paid for half of mine - and I would recommend Health Within for anyone with anything from severe pain to depression."